During the 1950’s and 60’s the US market opened up to Tanqueray, and was enjoyed by such personalities as Bob Hope, Frank Sinatra (apparently his favorite Gin), Sammy Davis Jr. and President Kennedy. During this time sales nearly doubled and was no doubt aided by then new (1948) distinctive green colored bottle shape - designed to look like a 1920’s cocktail shaker (not a 19th century London fire hydrant as some believe) and is the only Gin bottle with a worldwide patent. Tanqueray have and have had a variety of marketing campaigns in the US, some of these slogans include “Ready to Tanqueray?” and “Tonight we Tanqueray.” Even today Tanqueray’s biggest market is the US and imports around 14 million bottles each year to this country. Tanqueray uses neutral grain spirit distilled three times in copper pot stills with botanical flavorings according to a secret family recipe. This mix is then distilled for a fourth and final time, in the 10,000 liter No. 4 still “Old Tom” with aromas and flavors infusing in the vapors, which are condensed to form the Gin (Fun thought: distilled 4 times, in No.4 still and with 4 botanicals). Tanqueray believe this method adds an extra step to the double distillation process, which assures smoothness, complexity and delicacy of flavor. The water used is a blend from a deep bore hole at the distillery and demineralized water – as a way of resembling the water used in London as closely as possible. Its distinctive green bottles (introduced in 1948) are iconic and have the Tanqueray family crest on the packaging, showing a pineapple and two crossed battle-axes. The pineapple represents hospitality (in the 1800’s they were rare and expensive) and the battle-axes are said to represent the family’s participation in the third crusade. This product is glutten-free and vegan friendly. 47.3% (95 Proof), USA and Canada. During the 1950’s Tanqueray added the term “Special Dry” to this 47.3% ABV version. It is also available in 40% (80 proof) in Australia and New Zealand & 43.1% (86 proof) in the UK and other parts of Europe. 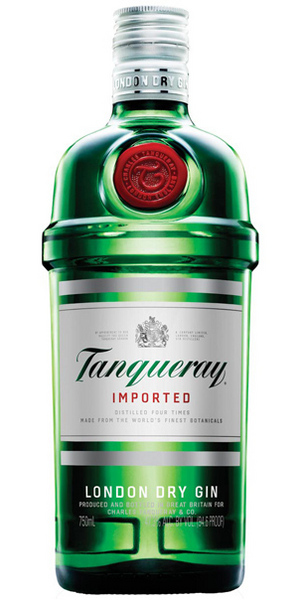 Tanqueray added the term “Export Strength” to this 43.1% ABV version in 1999. $$ - $$$. Available online try: K&L Wines, Beltramos, Merwin Liquors or Hi-Time Wine Cellars. The 4 botanicals are: angelica root (Saxony), coriander (Russia), juniper berries (Tuscany, Italy), and liquorice. Named after the company founder, Charles Tanqueray. The Gin is fondly referred to as "Tanq." by many fans. On the nose is pine (juniper) and citrus (lemon & orange - with the orange taking on a floral note, just like orange blossom – plus a faint hint of anise. On the palate this smooth medium bodied dry but slightly sweet spirit displays strong juniper and an astringent bitter citrus bite (coriander) with light peppery and spicy notes. This is crisp, refreshing, well rounded and easy to drink – it gives Beefeater a run for its money and will no doubt delight many gin drinkers. This seems to get better the more one drinks, as the botanticals open up and deliver greater accents of taste. While not perhaps at it’s best as a sipping Gin it shines through very nicely in a Gin & Tonic. It is suitable in a Martini although ardent Gin drinkers may prefer something with more complexity. Having sampled both the UK and USA strengths (although not side by side) there is very little difference between the two, but we do prefer the stronger American version – perhaps because the flavors develop more readily! 96 – 100 Points, Wine Enthusiast. 92 Points, Ultimate Spirits Challenge. Double Gold Medal, San Francisco World Spirits Competition, 2012. Silver Medal, San Francisco World Spirits Competition, 2011. Silver Medal, International Spirits Challenge, 2011. Gold Medal, International Spirits Challenge, 2010. Gold Medal, World Spirits Competition, 2009. Silver Medal, San Francisco World Spirits Competition, 2009. Gold Medal, Drinks International Gin Challenge, 2008. Gold Medal, Spirit Master Awards, 2008. Silver Medal, San Francisco World Spirits Competition, 2008. Top Gin and Double Gold Medal, San Francisco World Spirits Competition, 2007. Silver Medal, International Wine and Spirit Competition, 2007. Double Gold Medal, San Francisco World Spirits Competition, 2006. Gold Medal, World Spirits Awards, 2006. Silver Medal, International Wine and Spirit Competition, 2006. Best Gin and Double Gold Medal, San Francisco World Spirits Competition, 2005. Bronze Medal, International Wine and Spirit Competition, 2005. Best of Show (White Goods) and Double Gold Medal, San Francisco World Spirits Competition, 2004. Double Gold Medal, San Francisco World Spirits Competition, 2003. Silver Medal, International Wine and Spirit Competition, 2003. Silver Medal, International Wine and Spirit Competition, 2002. Gold Medal, International Wine and Spirit Competition, 2001. Bronze Medal, San Francisco World Spirits Competition, 2001. Silver Medal, San Francisco World Spirits Competition, 2000. Silver Medal, International Wine and Spirit Competition, 1999. Gold Medal, Monde Selection, 1998. Silver Medal, International Wine and Spirit Competition, 1997. Gold Medal, Monde Selection, 1997. Gold Medal, International Wine and Spirit Competition, 1996. Trophy and Gold Medal, Monde Selection, 1996. Gold Medal, Monde Selection, 1995. Silver Medal, International Wine and Spirit Competition, 1994. Gold Medal, Monde Selection, 1994. Silver Medal, International Wine and Spirit Competition, 1993. Bronze Medal, Monde Selection, 1993. Gold Medal, Monde Selection, 1992. Gold Medal, International Wine and Spirit Competition, 1987. Gold Medal, International Wine and Spirit Competition, 1985.